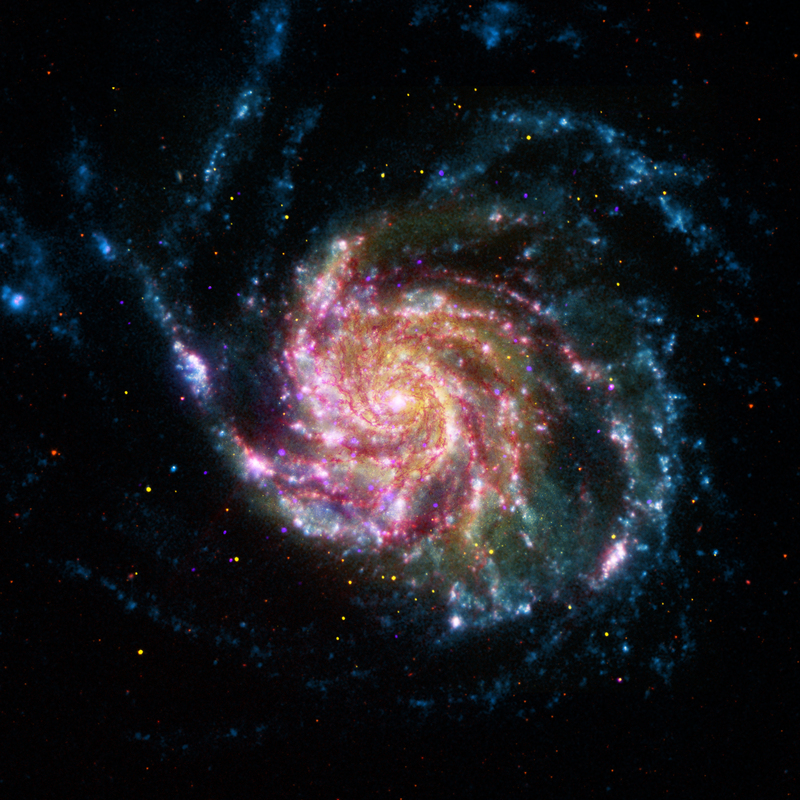 A new composite of M101 (aka, the "Pinwheel Galaxy") contains data from four of NASA's telescopes in space. X-rays from Chandra (purple) show the hottest and most energetic areas of this spiral galaxy. Infrared data from Spitzer (red) and optical emission from Hubble (yellow) trace the dust and starlight respectively. 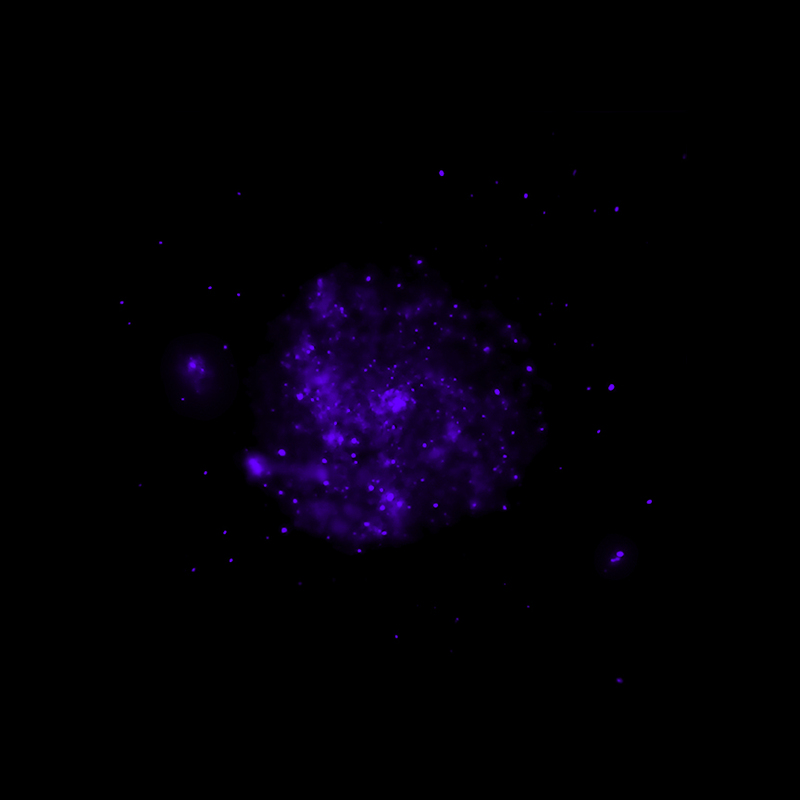 Ultraviolet light from GALEX (blue) shows the output from young stars. This image of the Pinwheel Galaxy, or also known as M101, combines data in the infrared, visible, ultraviolet and X-rays from four of NASA's space-based telescopes. This multi-spectral view shows that both young and old stars are evenly distributed along M101's tightly-wound spiral arms. Such composite images allow astronomers to see how features in one part of the spectrum match up with those seen in other parts. It is like seeing with a regular camera, an ultraviolet camera, night-vision goggles and X-ray vision, all at the same time. The Pinwheel Galaxy is in the constellation of Ursa Major (also known as the Big Dipper). It is about 70% larger than our own Milky Way Galaxy, with a diameter of about 170,000 light years, and sits at a distance of 21 million light years from Earth. This means that the light we're seeing in this image left the Pinwheel Galaxy about 21 million years ago - many millions of years before humans ever walked the Earth. looks like a duck wearing a jester's hat. The Pinwheel Galaxy looks like it spins in a counter-clockwise motion. So it might not even be there anymore. How can we see the UV light from stars that were created one million years ago, when the galaxy is 25 million light years? It is amazing how big it is out there, we are a grain of sand in the universe. Excellent images. Thanks for sharing them. Thank you very much for these fabulous photo album. Interesting that the younger stars are in the arms of the galaxy. A spiral galaxy located about 21 million light years from Earth. About 21 million light years from Earth. X-rays from Chandra X-ray Observatory, Optical from Hubble Space Telescope, Infrared observations from Spitzer and Ultraviolet light from GALEX. X-rays are purple, infrared red, optical yellow and the ultraviolet blue.